Inspiration is the best remedy to tackle our fear. I chose this after watching Jannete Oke's 'Love Comes Softly' movie series. Surely another sensational work by her, but very disappointing for this being a one-off movie. It was a wonderful western-drama, had an awesome beginning. In fact, it was more cheering and more inspiring than the other movie I mentioned in the first line. I think the author was so fond of telling the western frontier stories that set in the latter half of the 19th century and no doubt that she mastered carving them. But this one takes place in the year 1910 Canada, where a young woman, Elizabeth Thatcher from a wealthy family who aspires to be a school teacher. She's who afraid of her own shadow and never been in the harsh world around her. But she decides to leave her fear behind and take up the challenges in the life. Upon a bet between she and her elder sister, she must prove her capability to tackle any difficulties that come her way while chasing the dream job. But her inspiration comes in a peculiar way and then determines to follow the same footstep. As usual for a small screen movie, most of the cast were unfamiliar. Not that Maggie Grace was the only one to highlight in the movie, but every character and the cast who represented them were so impressive. Music was another great feature. The style of narration was simply acceptable, including a decent cinematography and wonderful locations. 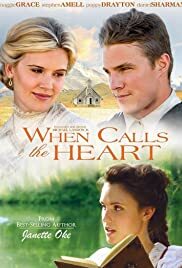 The same filmmaker who made the first four films of 'Love Comes Softly' also wrote the screenplay and directed it. The end was so sudden, but the overall movie was very short. I felt it was only the beginning and I am not wrong after all. After the movie I went to look for a sequel, if it had one. But I was very confident, there should be a continuation somewhere and more storytelling to follow. Likewise, I found something interesting that I briefed in the final paragraph. "It appears I'm not fit to go west." I am not fond of those products that made specially for the televisions. Only recently I began to explore them and got distracted by the flaws, precisely to say the technical errors are huge. But then after sometimes I understood, for a low budget and the television standards, those are exceptional. I think I am kind of starting to like the Hallmark movies as well the author Jannete Oke's master works. I don't know this story would have impacted largely if it was made as a theatrical feature with a big cast, but I am satisfied highly this so sweet little television film. Now I realised that sometimes small stages can also showcase the great works in a standard to draw the section of its own audience. I know usually the literature lovers would loathe the adaptation like this one, but I'm a movie fanatic and this is the only way to connect with the great literatures. There are eight books in this series called 'Canadian West' series, but the filmmakers decided to turn the rest of the books a television series. Since I loved this film a lot I am planning to watch the series as well. Actually, this one was a pilot movie for the series, so lets see how wonderful they are going to be, but the ratings and reviews are overwhelmingly poured on the movie sites. I'm very eager and we'll meet there in the review if I get a chance to see them. For now I strongly recommend this film for family audiences and also, especially who are looking for the inspiration.